Convenient, time-saving, economical, sterile packaging. 6 Kerlix™ Super Sponges for cleaning and dressing. One 10" x 12" ABD Pad, extra thick with high absorption capacity and Wet-Pruf moisture barrier which retards fluid strike-through. 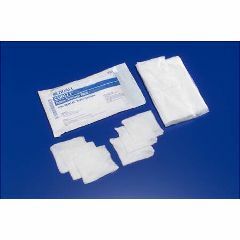 AllegroMedical.com presents The Curity Heavy Drainage Pack. Convenient, time-saving, economical, sterile packaging. 6 Kerlix™ Super Sponges for cleaning and dressing. One 10" x 12" ABD Pad, extra thick with high absorption capacity and Wet-Pruf moisture barrier which retards fluid strike-through. Convenient, time-saving, economical, sterile packaging.